The wise king Solomon once said, “Of the making of books there is no end” (Eccl 12:12). This is certainly true concerning all subjects including the people, nation, and land of Israel. The theological and political significance of Israel has been discussed more in the last two generations that of any other theological topic. It is with this backdrop that Joel S. Rosenberg’s foreword for The People, The Land, and the Future of Israel (henceforth Future of Israel) touts the volume as “the first of a kind” because of its practicality and emphasis on reading “through the lens of Scripture” (11). 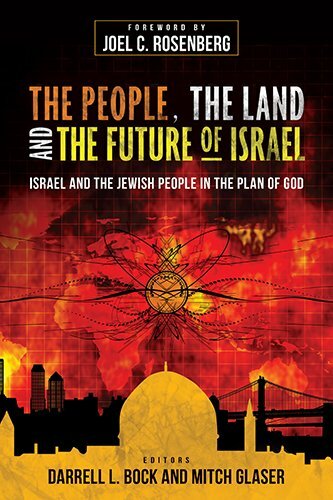 Written by multiple authors excelling in their fields and edited by Darrell Bock and Mitch Glaser, Future of Israel is a sufficient resource on the pro-Israel stance taken by Zionist and Dispensationalists alike. However, it is not unique or practical. The essays contained in Future of Israel come from lectures presented in 2013. This principal fact elucidates many of the pros and cons of the volume and its selection of authors and topics. The volume focuses on four major categories: “Hebrew Scriptures” (chapters 1-4), “New Testament” (chapters 5-8), “Hermeneutics, Theology, and Church History” (chapters 9-13), and “Practical Theology” (chapters 14-17). Each section written, presumably, to show that Christians who believe “the Church has replaced Israel” (22), labeled “supersessionist,” have ignored “a clear look at what the Bible says” (23). Unfortunately, from the start Future of Israel suffers from a lack of valuable content. The chapters that make up “Hebrew Scriptures” are simply a recounting of the Scriptures. The only profitable portions appearing when Dr. Chisholm Jr. introduces his hermeneutic of “contingency” for God’s Old Testament promises, promises which “the prophets actually anticipated the fulfillment of…in their time” (61). Each promise in the Old Testament is subsequently put off for the future since the “contingency” of Israel’s mass repentance remains unfulfilled. In a similar way, Dr. Michael Brown quotes Rabbinical teaching, admittedly fascinating, and provides a cursory quotation of New Testament texts (Matt 19:28 and Acts 3: 19-21) on his way to declaring that this view is “Biblical theology” (75). Little is provided beyond a straightforward reading of the Biblical text. In discussing the “New Testament” (chapters 5-8), Future of Israel moves further away from mere historical recounting and begins to address interpretations of the Biblical text. In addressing the book of Matthew, Dr. Wilkins provides an agreeable understanding of Christ’s ministry to the Jews and Gentiles (90-97). However, as the topic turns to the land (and hence nation) of Israel, Dr. Wilkins provides inadequate grounding and defense from Matthew 10:23 (97) and Matthew 24 (99). The arguments put forth ignore the widespread literature on preterism and higher criticism. Dr. Bock’s chapter on Luke-Acts is unquestionably the highlight of the first half of Future of Israel. Demonstrating scholarly work, Dr. Bock presents many things with which “supersessionist” postmillennialist can agree (especially if they share agreement on Romans 11:25-26). Following up Dr. Bock, the chapter dedicated to Romans (chapter 7) addresses Romans 11 insufficiently and provides one of the more shocking quotes when it claims “that there is a practical distinction between the intent of Christ’s death for Israel and for Gentiles” (129). Dr. Craig Evans closes out the section with a lackluster evaluation of the “author” and “audience” of Hebrews and the General Epistles with almost no significant application to either the nation of Israel or the future of the land (142-145). These are the first signs that perhaps the original constraints of the conference’s lectures affected the content of this entire volume. Again while addressing “Hermeneutics, Theology and Church History” (chapters 9-12), Future of Israel demonstrates its mixed quality. Both Dr. Blasing (chapter 9) and Dr. Saucy (chapter 10) provide valuable points that are worth responding to by “supersessionists.” However, these points come alongside inadequate simplifications (e.g. the lumping together of Alexandrian and Antiochene schools of interpretation, 152-153). Two of the concluding chapters by Dr. Feinberg and Dr. Vlach reiterate the oft-repeated statements and arguments of Dispensationalism that are not new, insightful, or primarily Biblical. As a further example, Leventhal’s chapter on “Israel in the Light of the Holocaust” (a historical reflection) is the length of Dr. Blasing and Dr. Saucy’s chapters on hermeneutics combined. Far from demonstrating a focus on understanding the Scriptures, Future of Israel resorts to the very “politically and historically based responses” of which it is critical (23). The final section, concerned with “Practical Theology,” is certainly where the “immensely practical” (11) elements of this volume where meant to be found. Unfortunately, Future of Israel can only muster “Evidence for the Truth of Scripture” (chapter 14) that is based on history and a chapter reflecting statistics of poorly participated survey of Seminary faculty and theology (chapter 17). Despite its large breadth of material, Future of Israel is neither unique nor new in its critical or Biblical analysis. Instead of addressing the Scriptures, The People, The Land, and the Future of Israel presents an unbalanced emphasis on old arguments and conjecture. A summary of all things Zionist and Dispensational, Future of Israel is simply a repackaging of old evangelical theology for a generation that has already become disenchanted with these roots. Ryrie’s Dispensationalism Today or scholarly works by Dr. Bock, Dr. Saucy or Dr. Blasing would better serve individual interested in studying the Biblical pro-Israel arguments.